Sociologist Dr David Farrugia is supporting the development of strong regional communities through his study of how youth in regional areas are responding to conditions of high unemployment and industrial restructuring. Dr Farrugia, a member of the Newcastle Youth Studies Group, secured a 2016 Australian Research Council (ARC) Discovery Early Career Researcher Award to support his three-year project which will provide an innovative evidence base for the design of welfare interventions and social policies that support marginalised young people to build fulfilling employment futures. The project, titled ‘The Formation of Young Workers: A Multi Sited Study on the Periphery’, has two components. The first part focuses on key social changes connected with the geographical distribution of work. Dr Farrugia says an important example of this is the shift in Australia from an economy that’s based primarily on manufacturing and primary industries to an economy that is based on services. Anything from accountants at one end to the people that make those accountants coffee in the morning. “This shift has taken place differently in areas. In the big cities we have seen the explosion of a service sector. But in the regions you have places that were dependant on one or two industries and the absence of those industries creates a really unique situation in the labour market,” he said. Changes to labour market are also related to changes in the relationship between young people and work, which is the second component of Dr Farrugia’s project. “Because of where young people today tend to work, there has been a breakdown in any kind of meaningful distinction between the person you are in general, the skills that you have to go to work, and the actual practice of doing your job,” Dr Farrugia explains. “They are expected not just to get jobs but to invest themselves in work and to have work be fundamental to who they are. For example, young people are disproportionately working in jobs that involve face-to-face interaction with people – anything from working in a café to a hotel. These types of businesses value ‘youthfulness’. If you can present an appropriately youthful disposition this is seen as a ‘nice encounter’ that the customer will enjoy. While government policy is often aimed at strengthening service labour markets in big cities, Dr Farrugia says little has been done to examine regional and outer-urban areas – as they are seen as irrelevant to policy makers. “These are young people who are seen, in a sense, as uninteresting and unimportant. Not only that but they are encouraged, If you can’t get a job, move, go to where there is work,” Dr Farrugia said. A longitudinal study and in-depth interviews with a group of about 90 young people will focus on regions where there has been a particular pattern of industrial restructuring and change to the labour market in general and, particularly, the youth labour market. However, while the project is set in regional Australia, Dr Farrugia says these areas are important focal points of broader social and economic changes that reflect the dynamics of globalisation. 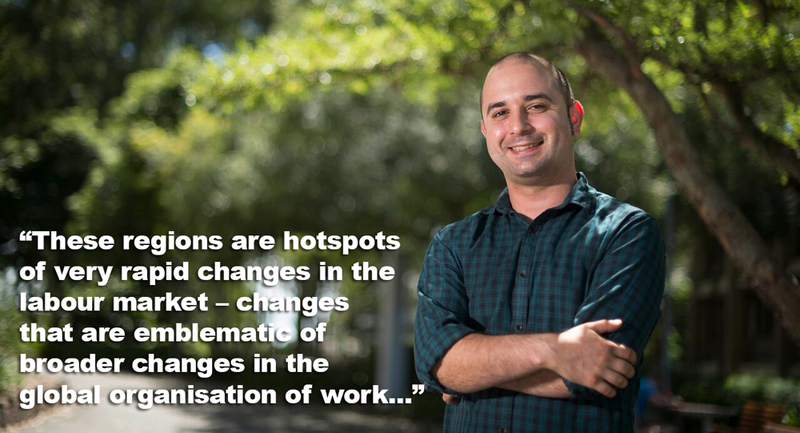 “These regions are hotspots of very rapid changes in the labour market – changes that are emblematic of broader changes in the global organisation of work that have seen countries like Australia shift to increasingly urban-centric service economies.” Dr Farrugia said. “Regional areas teach us not just about the regions, they teach us about the Australian labour force, the Australian labour market and Australia’s position within the dynamics of globalisation – and that is why they need to be studied. That is why they need to be included in government policy,” Dr Farrugia concludes.